You can download an audiobook of J.M. 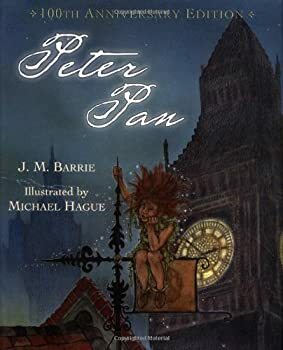 Barrie’s Peter Pan for free at Librivox and an ebook at Project Gutenberg. Here’s the J.M. Barrie website. Peter Pan: Do you really know him? Most people think they’ve read — or at least know — the story of Peter Pan. The figure of the boy who refuses to grow up has become so infused in Western culture that he’s taken on a life beyond his literary beginnings, starring in countless theatrical productions, movies, television series, prequels and sequels, his image used in merchandise (everything from records to peanut butter), and on several famous statues around the world (the most famous being the one in Kensington Gardens) and even providing the namesake behind a psychological condition (we’ve all heard of people with a “Peter Pan syndrome,” referring to those who refuse to accept the responsibilities of adult life). And then there’s that other Neverland which lends unfortunate connotations to Barrie’s work.